There’s a 500 mm length of 16 mm round linear motion rod / shaft inside the small blue-and-white box. 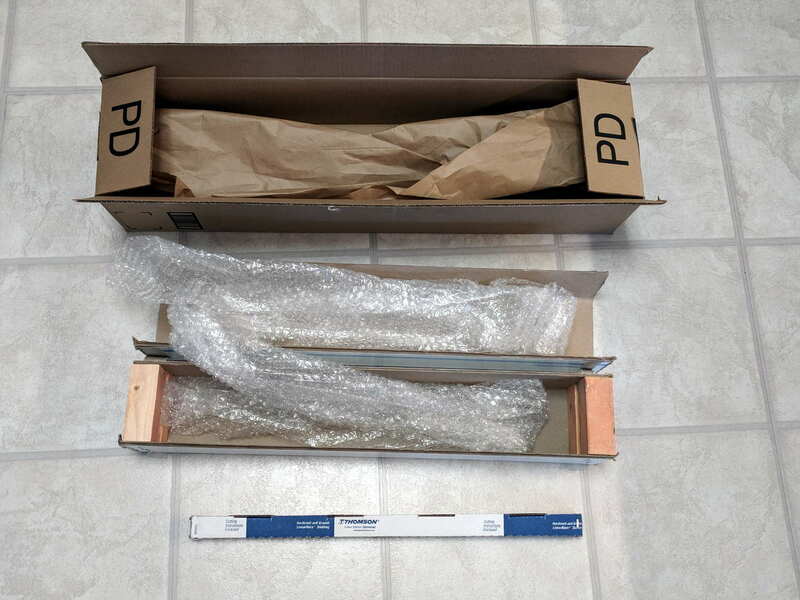 Previous shipments of similar rod have arrived in a lightly padded envelope or rattling loose in a box of other stuff. The small blue-and-white corrugated cardboard box contains a bag protecting the well-oiled shaft, with padded end caps preventing the shaft from escaping or whacking against anything. The middle box is made from two U-shaped sheets of molded (not corrugated) fiberboard, with one rigid U stapled into those wood end caps, the other U fitting over the assembly, and plenty of packing tape securing the two. Enough bubble wrap fills the cavity to surround and completely immobilize the inner box. FedEx carried the armored box from Thomson to an Amazon warehouse in February, so it wasn’t packed specifically for me. 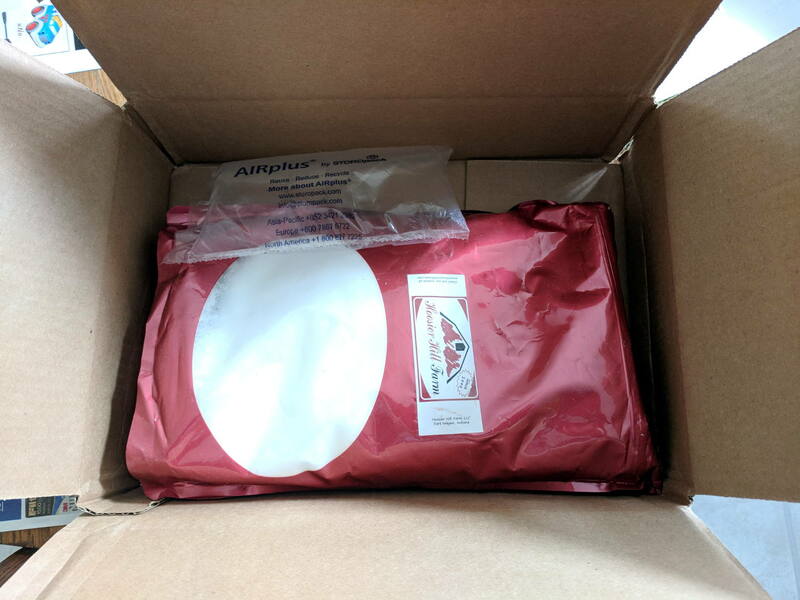 The upper box is a standard Amazon corrugated carton, with slightly more than a token amount of paper packed around the fiberboard box. The paper didn’t completely immobilize the middle box, but did serve to keep it from rattling loose. I paid twenty bucks for the rod, with “free” Amazon Prime shipping, and UPS delivered it in the usual two days. The whole affair weighs 7 pounds. If I were to reship it to somebody using UPS 2nd Day, they’d charge me $39 just for the shipping. Both ends of the carton were shredded, although all of the cardboard tubes and LED lamps remained still inside. Not all the tube end caps completed the journey, however. 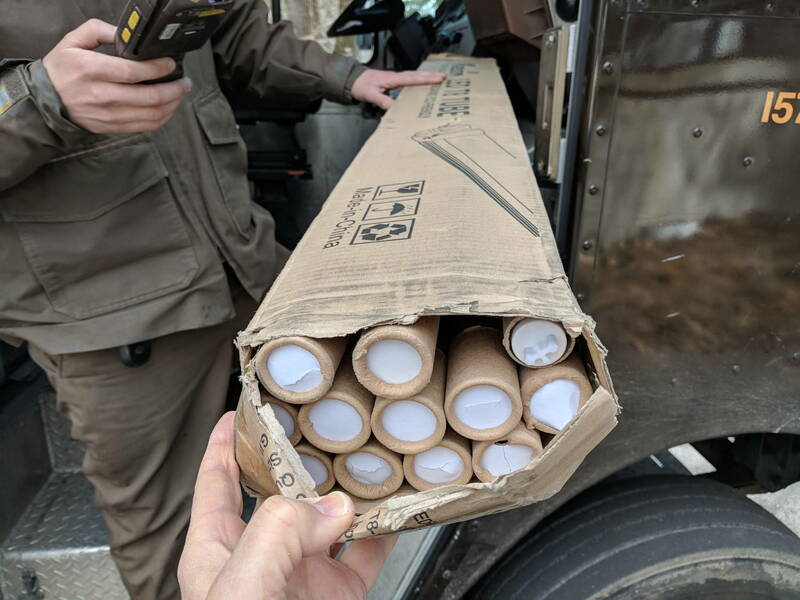 The carton didn’t sport the usual Box Certificate mark found on all Amazon cartons and was made of brittle Chinese cardboard, so it was intended for protected shipping, perhaps inside a freight container, not as a business-to-consumer shipping box. Somewhat to my surprise, all the LED lights worked, including several that shrugged off their tube caps, as in the upper right, or broke their white cardboard end plates, as in the rest. The plastic protectors on the LED pins served their purpose! Amazon provided a partial refund when I filed Package Feedback, so they’re paying attention to damages. This entry was posted on 2018-04-15, 07:31 and is filed under Home Ec, Machine Shop. You can follow any responses to this entry through RSS 2.0. Both comments and pings are currently closed.